Whist - thanoscardgamess jimdo page! This is a suite of two Whist games, the classic (standard UK/US rules) Whist and the Minnesota Whist, which, as the name implies, is played in Minnesota (both northern and southern variants are available). In this game you can play the classic game of whist with authentic scanned decks, against strong opponents and with realistic animation using the DirectX engine. Whist is a plain-trick game (without bidding) for 4 players in fixed partnerships. Although the rules are extremely simple there is enormous scope for scientific play. 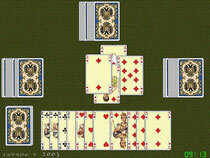 Whist was derived from the older game Ruff and Honours.There are four players in two fixed partnerships. Partners sit facing each other. The dealer deals out all the cards one at a time so that each player has 13.The player to the dealer's left leads to the first trick. Any card may be led. The other players, in clockwise order, each play a card to the trick. Players must follow suit by playing a card of the same suit as the card led if they can; a player with no card of the suit led may play any card. The trick is won by the highest trump in it - or if it contains no trump, by the highest card of the suit led. The winner of a trick leads to the next. Each hand is played either "high" or "low". If it is played "high", the partnership that takes at least 7 of the 13 tricks scores points. If it is played "low", a partnership must take 6 or fewer tricks to avoid losing points. All four players indicate whether they wish to play the hand as "high" or "low" by simultaneously placing a card face down in front of them. A black card indicates that they wish to play "high"; a red card indicates that they wish to play "low". Usually players pick their lowest red or black card to represent their bid. Starting with the player to the left of the dealer, each person turns over their bidding card in turn. If the card is red, the next player to the left turns over their card. If any card is black, all revealing of bid cards stops and the hand is played "high". Only if all four bidding cards are red is the hand played "low".